I was lucky enough to get an unexpected chance to go to the cinema earlier this week. What I went to see will be obvious from the title of this article. Since I became a parent on New Year’s Day 2015, I’ve seen the following films on the big screen. Do you see a pattern? My first and last visits to the cinema underscored the problem I’ve had since becoming a parent. I’m no longer in the position to go and see something just on the off chance that it’ll be good. I can just wait for it to come out on Sky. I don’t have an unlimited pass or anything like that so I’m likely paying top dollar each visit to the pictures. In times gone by, I’d have walked out of the cinema saying, “Oh, well. Never mind.” These days, I’m actually annoyed when I pay money to see something and it’s garbage. I had that experience with Alien: Covenant. It was made especially annoying because of the fact that I chose it over Guardians 2 which was what my gut was telling me to go and see. The fact that Guardians 2 was longer by about half an hour also played a role in the process as I reasoned that I was getting more value for my money. No, I chose to put my faith in Ridley Scott and, except for the first half hour or so of what he laid out for me, I felt nothing but boredom with how predictable it was. 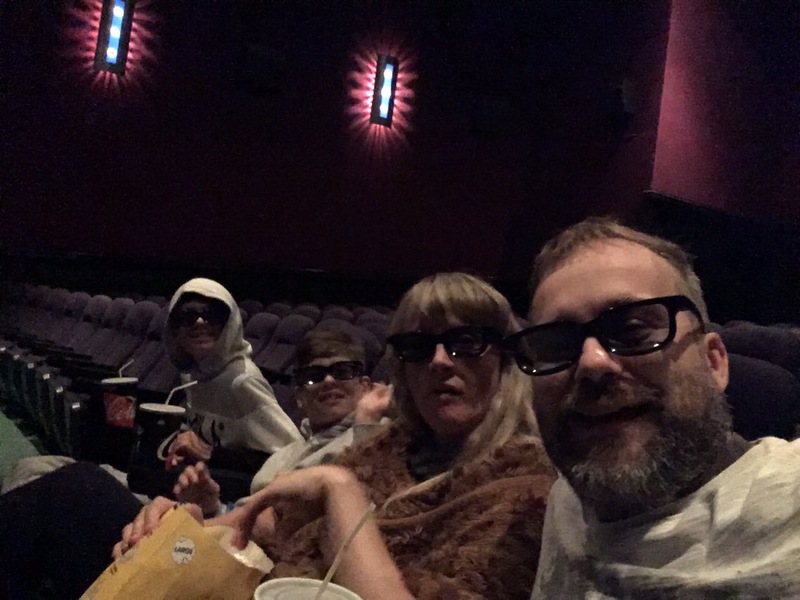 So, this week, the wife and I took our nephews to see Valerian: City of a Thousand Planets. I knew absolutely nothing about it before going and only had my brother’s positive tweet about it to reassure me. Serena managed to wangle some deal with Tesco vouchers and it was effectively free so it was a win-win situation from the start. I didn’t know the two leads very well but Clive Owen is in it and he’s always watchable. It was apacked house as you can see from the picture below. I’ve been a fan of Luc Besson’s work since seeing the brilliant Leon when I was at University. I also love the original Taxi film that he produced, starring Samy Naceri, Frederic Diefenthal and Marion Cotillard. If you haven’t seen it, it’s well worth looking up. Just be sure to watch the original French version. The dubbed one has ridiculous mockney accents which are like nails on a blackboard! I also love The Fifth Element, which has retained its ability to entertain even after quite a few viewings. So, I was cautiously optimistic about how Valerian would be. If it was anything like Fifth Element, it would at least be watchable. At the outset, I was a little worried when David Bowie started up. It seemed like a bit of a cliché to use that tune but the opening montage lived up to it as we see the Alpha station, where much of the film is set, growing and expanding as more and more diverse people and alien species join it. The opening then gives way to a distant planet where we are introduced to a peaceful, pearl-gathering species of aliens that bear more than a passing resemblance to the (can’t think of their names) ones from Avatar. Indeed, it’s worth pointing out that this film does remind me a great deal of James Cameron’s Dances With Wolves remake in its aesthetic. This race of happy aliens is then decimated by some calamity and we cut to our two heroes, Valerian and Laureline. I’ve never read the original graphic novels about these two. I did a bit of reading up on them and have come to the conclusion that they are reasonably faithful representations of how they were conceived originally. Laureline has been turned into a very capable agent in her own right which I think takes some time to develop in the comics where she spends much of the first few standing around in the style of an old Doctor Who companion, looking pretty and making the odd cup of tea. There’s been a lot of venom on certain Facebook groups to which I belong about Cara Delavigne’s performance as Laureline. For me, I can’t say I had a problem with it. I thought she did a pretty good job. She’s no Sigourney Weaver or Gina Torres but then not everyone can be. Dane Dehaan’s Valerian is the square-jawed type to begin with along with the requisite slavish adherence to duty that his comic-book inspiration apparently has. No, if I have a problem with anything, it’s that there had to be romantic tension between the two of them, set up rather clumsily at the beginning. I’d love to see a film where there’s a man and a woman who are just colleagues. I just found this aspect of things a little but distracting and felt that it was thrown in to tick an Executive Producer’s box. I don’t know what their relationship is like in the comics (it wasn’t on Wikipedia) so I can’t tell if this element of things is faithful but it just irks me a little. That’s something that’s more a problem with mainstream film-making in general, however – not specifically this film. Anyway, the two agents are then shown using their skills in a lovely setting called Big Market. As I come from Newcastle upon Tyne, there were certain associations that I couldn’t shake every time I heard it called that, but I was able to concentrate on what was going on enough to be swept away by the visuals. This film is a technologically advanced cousin to The Fifth Element. The same weight has been put on individual designs and concepts but with a great deal more power to realise these creations. Some of the alien species and locations are wonderful; so intricately detailed and varied that there is always something to look at. I’m so glad that I saw this in 3D, too. I usually hate seeing things in 3D but this was worth it. Again, like I think it did with Avatar, the 3D element really helped to accentuate some of the designs. From this first set piece involving the heroes, they are then drawn to the aforementioned Alpha station and into ever more dangerous encounters as they go along. I won’t explain the entire plot, only that it involves a shady government cover up of a cataclysmic event which wiped out a whole planet (there were big overtones of Joss Whedon’s Serenity in parts of the film, too: not least in this). I have to say that I had a lot of fun watching Valerian. There was clearly so much love put into the visuals and it was so good to see something that wasn’t part of an already existing franchise. Blockbuster films these days seem to be all about this or that ‘cinematic universe.’ It was good to see something; perhaps original is the wrong word, but at least something a bit different. I could sum it up by saying that it’s an absolute visual treat with a good, solid premise and enough meat on the bones, story-wise, to keep you entertained. I liked the two lead characters even though their development felt rushed (but isn’t that a criticism that could easily be levelled at the first Guardians of the Galaxy film). I don’t care for them the way I care for Malcolm Reynolds or Ellen Ripley but I wanted them to succeed. That’s the test for me. Do I care? I can’t take away from the huge enjoyment I experienced watching this film. It was lots and lots of fun. The fate of its characters didn’t move me though and I have to see something in that. You have the two lead characters and Rihanna’s shapeshifting alien. These are the ones we’re meant to feel for. Therein lies a flaw at the heart of the film. All three actors do a good enough job so I think the problem is with the script. There’s not enough in there to make our hearts beat in time with these people: to make us scared when they are scared or elated when they triumph (two exceptions: first is when they are rescued from the big beasty thing as they escape from Big Market – that sequence is fantastic, second is the bit where Laureline’s head is going to be cut open so that the Emperor can eat her brains – I squirmed a little then). I’ll say it again. I loved the film as I sat down to watch it and it was beautiful and exciting in equal measure and I certainly didn’t feel like I’d been hit over the head and robbed like I did when I walked out of Alien: Covenant. I just think maybe it was a more shallow experience that could have been deeper, much in the same way I feel about Avatar. It was beautiful to look at but there are potentially so many more exciting stories to develop in both these worlds.